How To Sign-up to the Student Resource Centre (SRC)! Thank you for you interest in the MHA SRC. Kindly follow the instructions below to complete the registration process. 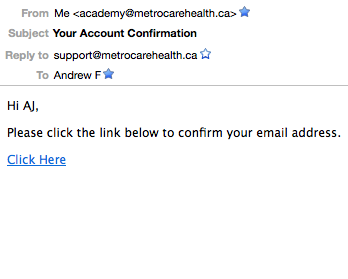 Check your inbox for a message from academy@metrocarehealth.ca with the subject line "Your Account Confirmation"
Kindly wait for approval of your registration by a Metrocare Health Academy representative. This process make take up to 24 hours. Once you have completed steps 1 and 2, you will gain access to the exclusive Student Resource for your program. Just click on www.metrocarehealth.ca/src, find your program and log in. While you wait for the process to complete, feel free to visit our upcoming workshops calendar and register for one of our great Workshops!